In celebration of Ajam Media Collective’s second anniversary, this article is co-written by Ajam Co-Editors-in-Chief Rustin Zarkar, Beeta Baghoolizadeh, and Alex Shams. For the first EIC co-written article, check out “Ferdowsi’s Legacy: Examining Persian Nationalist Myths of the Shahnameh.” All photographs were taken by Rustin Zarkar unless otherwise specified. 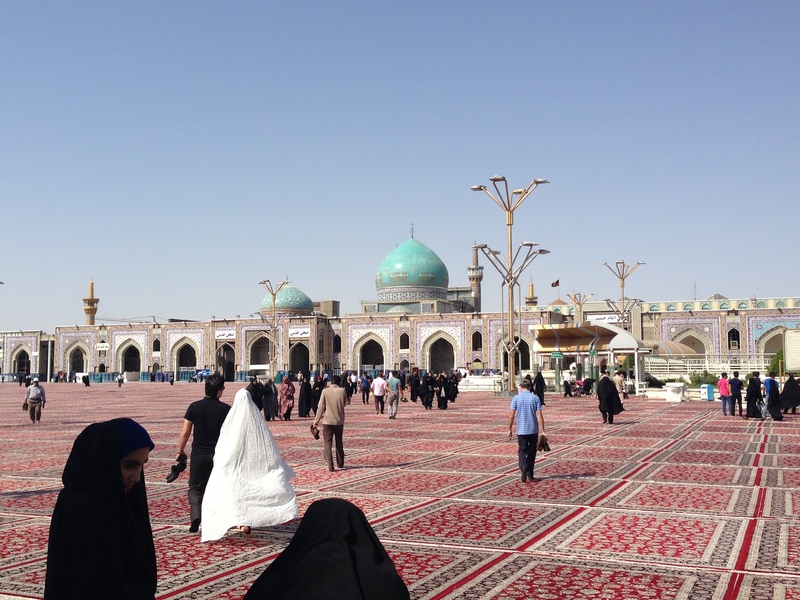 If Qom is the center of Shi’i jurisprudence and clerical authority in Iran, Mashhad serves as the nation’s spiritual capital. 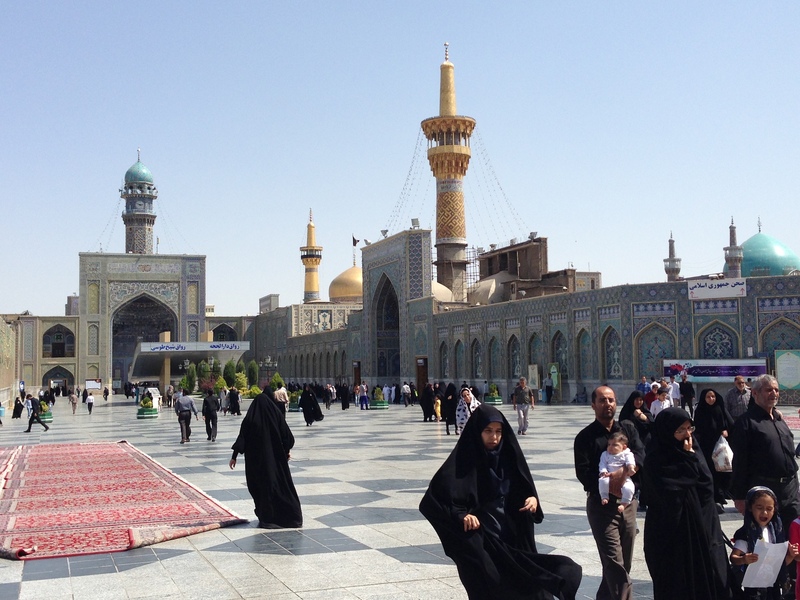 The Imam Reza Shrine complex, also known as the Haram, is located at the heart of the city, and sprung up after the Muslim leader’s passing. 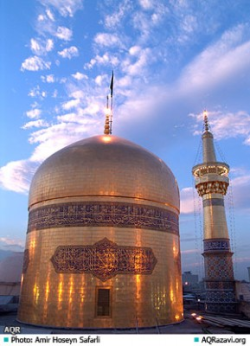 As the second-largest city in Iran today with over three million inhabitants, Mashhad owes much of its significance to the Imam Reza shrine, which has been built and rebuilt numerous times over the course of history. 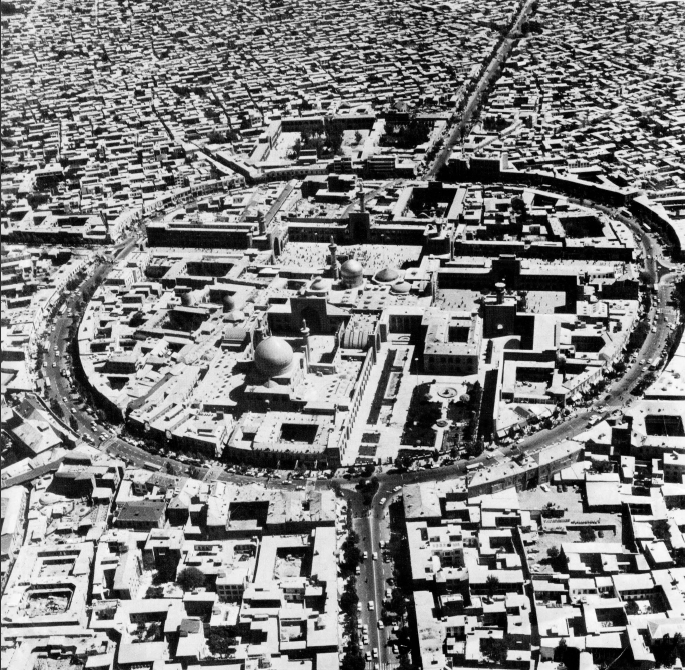 This article will look at how different governments claiming suzerainty over Mashhad left their mark on the architecture and urban space. Like the city itself, the shrine complex grew gradually over time as political elites tried to establish their legitimacy. Rulers strove not only to appease the local religious establishment by funding elaborate building projects around the site, but also hoped to create physical testaments to their political authority. Due to the inherent political nature of these structures (as well as the value of many of materials used in construction), the site was destroyed and subsequently rebuilt as it changed hands from dynasty to dynasty. 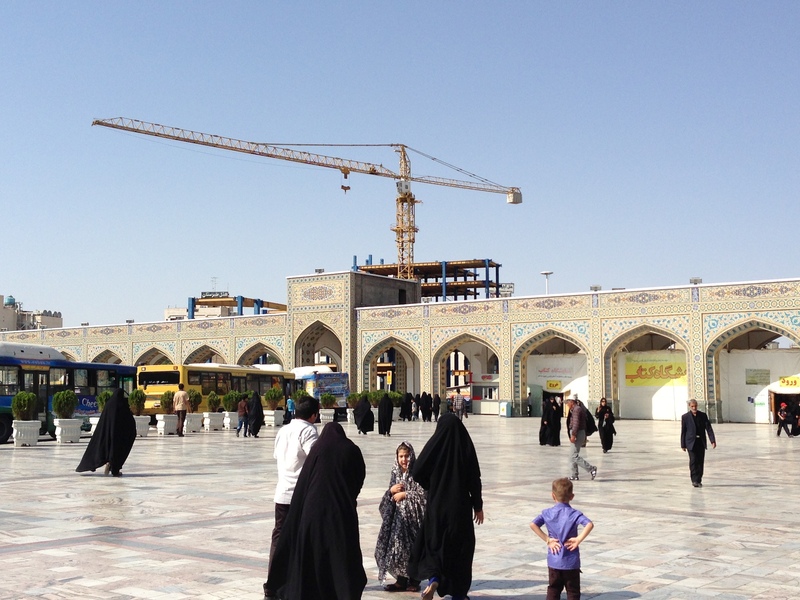 Because of Mashhad’s status as a holy city, construction is highly ideologically charged. The sacred here becomes spatial, and the spiritual becomes interpreted and articulated through the physical. These building projects offer indications of the complex, intertwined histories of power and religion in Iran. They also reveal how political and religious actors have used the physical space of the holy city as a site on which to articulate and contest ideological projects, a process that continues until the present day. Mashhad is the burial site of Ali Ibn Musa al-Ridha, the eighth imam (spiritual leader) in the Twelver Shi’i tradition, and is better known to Persian speakers as “Imam Reza.” Born in 765 AD in Medina, Imam Reza traveled to and spent the later years of his life in Khorasan, a historical region that spans what is today northeastern Iran, Western Afghanistan, and Turkmenistan. Although the exact date of his passing is debated, Shi’i sources agree that in 818 AD, Harun al-Rashid’s son and successor Al-Ma’mun murdered Imam Reza with poisoned grapes in the city of Tus. Buried next to Harun al-Rashid, Imam Reza’s resting place became known as “Mashhad” or “Mashad al-Ridha” meaning “[al-Ridha’s] place of martyrdom,” making Imam Reza the only Shi’i imam to be killed and buried inside Iran’s modern borders. 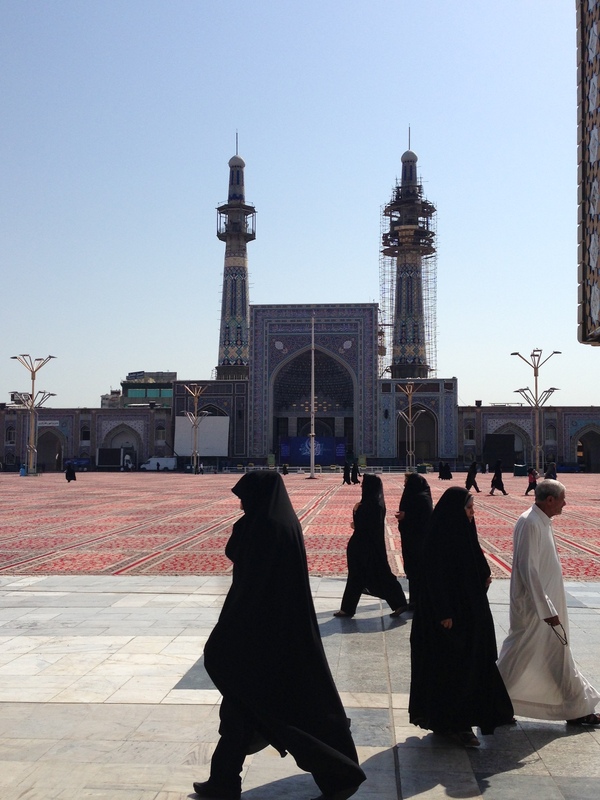 Shortly after Imam Reza’s death, Muslims of various backgrounds began visiting Mashhad as a place of pilgrimage, and the city was quickly established as a spiritual center. Within decades of his passing, a dome was built over the grave to serve as a visual marker for the shrine. Not all those who traveled to Mashhad left after their pilgrimage, and gradually the city became a center of commerce and travel in the region. 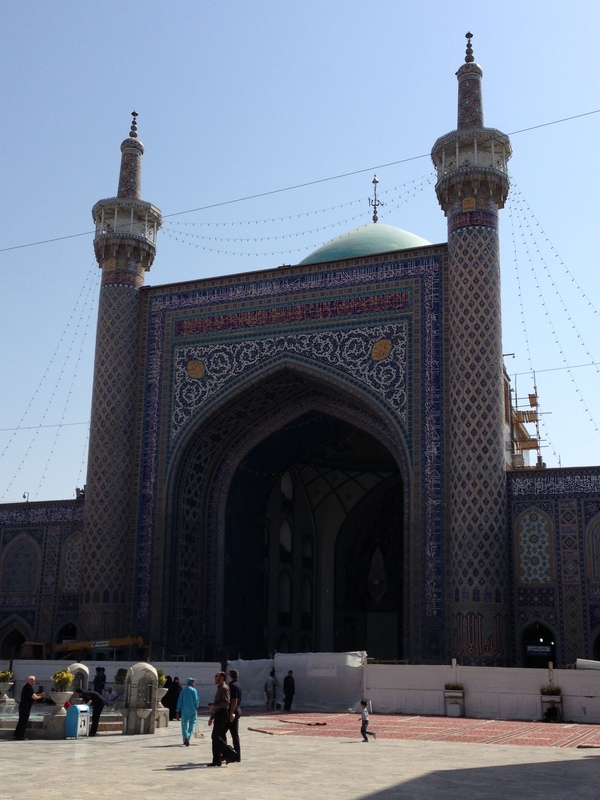 From the Ghaznavids (977–1186 CE) to the Ilkhanids (1260–1335 CE), the Imam Reza Shrine followed a cycle of expansion, destruction, reconstruction, and renovation. It was not until the Timurid period (1370–1507 CE) that the shrine complex and the city experience a substantial and sustainable growth. Following the death of Timur in 1405 CE, the Iranian Plateau was divided amongst his descendants. The de facto political fragmentation of the empire led to rivalries amongst relatives, which fostered a culture of patronage in the arts as the ruling elite tried to outdo one another. Some of the most active patrons of this period were from the court of Shahrukh (1377–1447 CE), based in Herat. 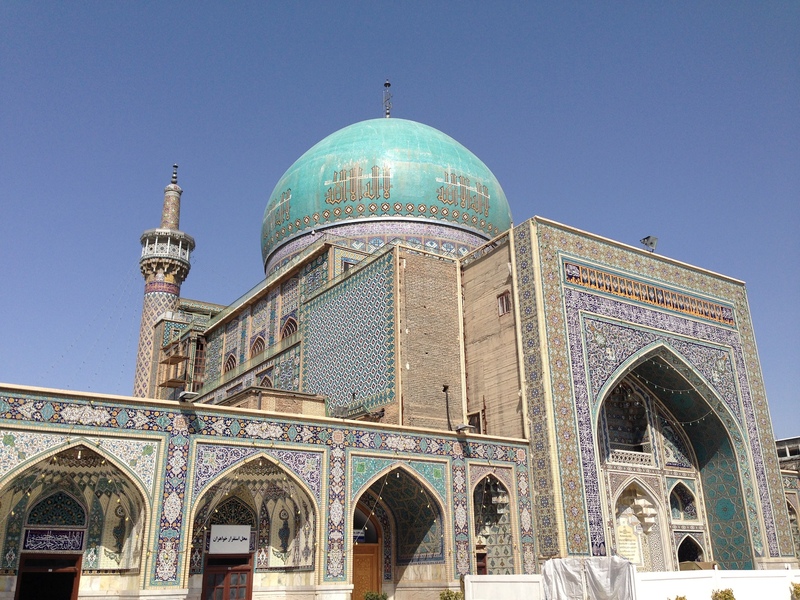 The Sultan’s wife, Gohar Shad (d. 1457), was responsible for commissioning the eponymous mosque that is considered the architectural jewel of the shrine complex. Built near the shrine by the renowned court architect Qavam al-Din Shirazi in 1416, the mosque served as a place of congregation for the ulema and other city residents. This program of construction and renovation continued during the latter years of the Timurid period. However, the building projects were no longer instigated solely by members of the royal family, but also increasingly powerful advisors and officials. For example, during the reign of Sultan Husayn Bayqara (1470-1506 CE), Amir Ali Shir Nava’i – the famous politician and celebrated poet- built hundreds of religious and academic structures. Nava’i was responsible for creating the oldest open space in the Shrine complex (called the Old Courtyard) as well as its highly ornate gates. Upon coming to power in 1501, the Safavids declared Iran a Shi’i state. Although the Safavids were not the first Shi’is to rule Persia, they were the first dynasty to promote Twelver Shi’ism as the official state religion, beginning a process of proselytization with the objective of spreading the faith among their subjects. The Safavid conversion of Persia to a Shi’i empire beginning in the 16th century made Imam Reza’s Haram an extremely significant site for articulating their ruling ideology. Early Safavid rulers were consumed with establishing their legitimacy and maintaining control of the empire, but by the end of the sixteenth century, changes to the visual landscape of Shi’ism in Iran started appearing as well. Shah Abbas I was the first Safavid ruler to devote resources for renovations to the shrine complex after making the pilgrimage from his capital of Isfahan to Mashhad on foot in 1597. Through a series of renovations starting in 1601, he was responsible for doubling the size of the Old Courtyard and adding two more ivans; his patronage is most visible on the Ivan-e Sa’at, where he installed the large clock tower above the balcony and employed master calligraphers to decorate the walls of the gate. 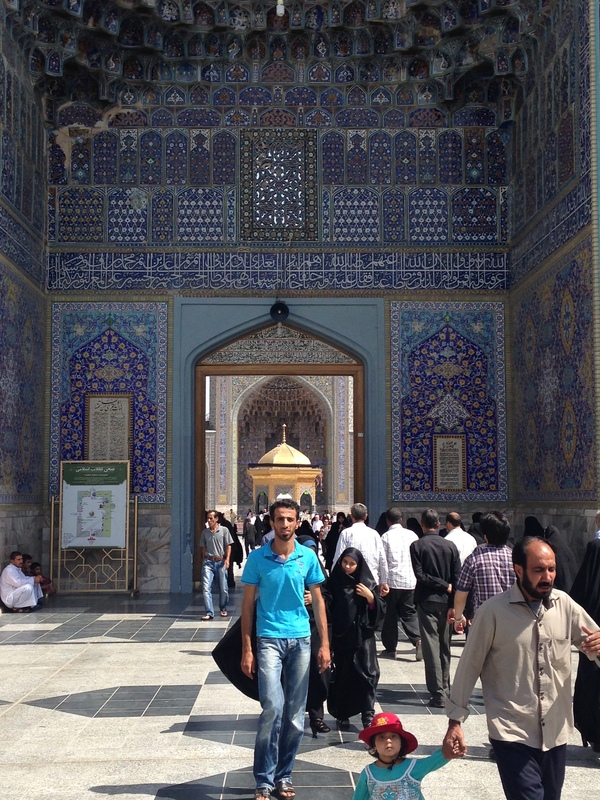 While the site has been considered a locus of pilgrimage since the death of the Imam, Farmanfarmaian argues that Shah Abbas began promoting the site in order to “deflect the flow of pilgrims and their money from the more important shrines of Ottoman-controlled Iraq.” Abass’ attention to Mashhad reflects a desire to legitimate Iran as a Muslim Shi’i power on the international stage and to challenge the prestige of the Ottoman Caliphate, despite their control over major holy sites like Mecca, Medina, Karbala, and Najaf. 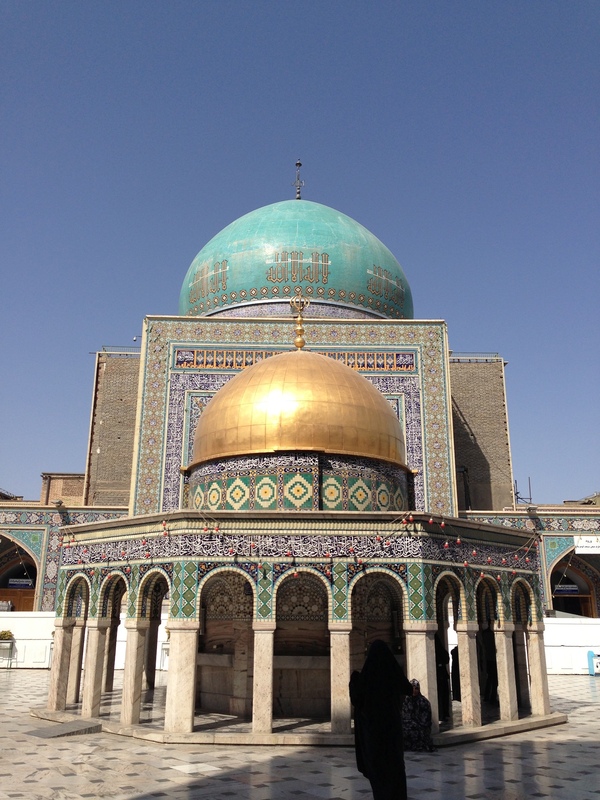 Like Shah Abbas, Aqa Mohammad Khan Qajar is said to have walked barefoot to the tomb of Imam Reza in 1796, where he spent twenty days in the Haram praying and working as a servant. This act of piety is significant, because it reflects the importance of properly engaging in an act of worship for their own sakes. Aqa Mohammad Khan Qajar, like other rulers before and after him, may have believed that without properly going on pilgrimage, his rule would not be given divine blessing. In fact, similar reasons could be given for Shah Abbas’ decision to embark on a similar pilgrimage two centuries prior. Such intensive acts must be considered beyond their public value, since they go above and beyond a general effort to gain political legitimacy. Perhaps these shahs were seeking Imam Reza’s approval as rulers of the sole Shi’i empire of their eras. Of course, such acts are not necessarily bereft of any political value. When Aqa Mohammad Khan Qajar made his pilgrimage, he had recently taken Mashhad from Shahrukh Shah, the grandson of Nader Shah Afshar, in 1796. By visiting Mashhad personally, Aqa Mohammad Khan Qajar was able to establish himself amongst the city natives who knew little about the new king. Aqa Mohammad Shah Qajar was succeeded by his nephew, Fat’h ‘Ali Shah who continued to expand the Qajar state. Mashhad had been the capital of the short-lived Afsharid Empire, and although Shahrukh Khan had been defeated, it remained a stronghold of the Afsharids until Fat’h ‘Ali Shah launched two prolonged sieges on Mashhad and drive out the last of the remaining Afsharids. The sieges, undoubtedly, devastated the city, and Fat’h ‘Ali Shah began a program of reconstruction and expansion for the Haram complex. The New Courtyard was one such addition. Looking to establish their power independently of ulema control, the Qajars supported forms of popular Shi’i culture that were less driven by texts but instead on local traditions, thus placing them beyond the realm of clerical authority. 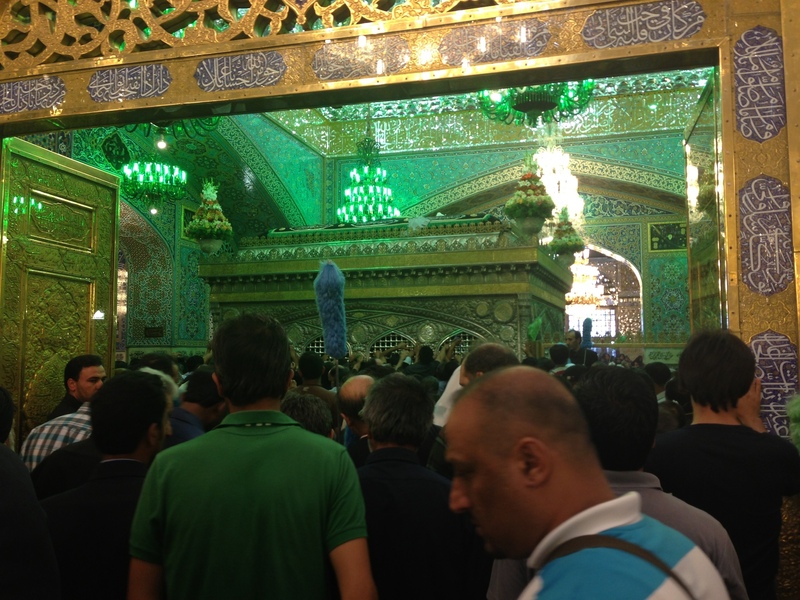 These included taziyeh performances and the rebuilding of shrines. Qajar support for Shi’i shrines included the funding for repairs and general maintenance of Shi’i shrines or mosques in even the Ottoman Empire, especially those in Karbala and Najaf. Naturally, the Qajars paid special attention to the maintenance and expansion of the Imam Reza Shrine, as the most important Shi’i site under their jurisdiction. And so, these additions continued with subsequent Qajar kings. In 1861, Nasir al-Din Shah renovated the ivan leading into the shrine chamber from the New courtyard by covering it with gold. It is now accurately known as the Ivan-i Talai-e Nasiri, or the “Nasiri Golden Ivan.” Nasir al-Din Shah also ordered the installation of masterful ayeneh kari or “mirror-work” in the shrine, covering earlier Safavid-era decorative pieces with mosaic-like mirrored patterns. 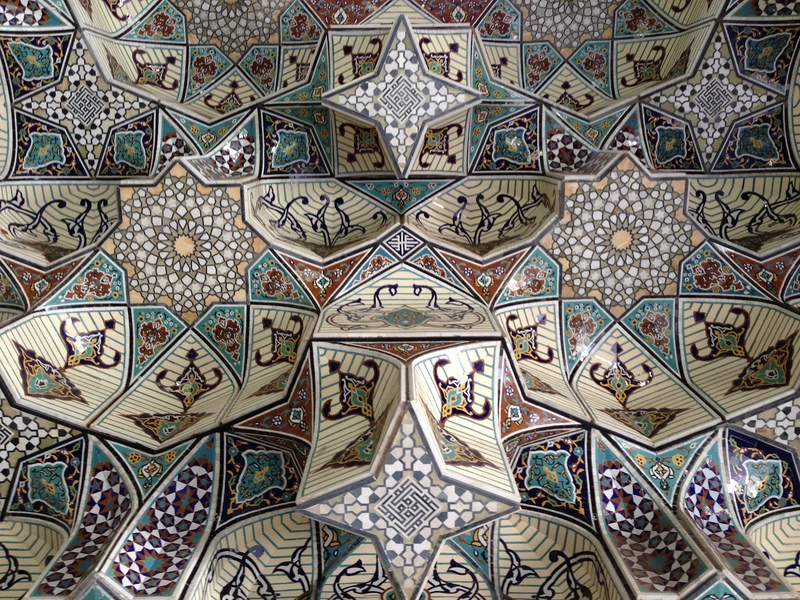 Mirror-work became a distinctly Iranian art, famously associated with the Imam Reza Shrine. 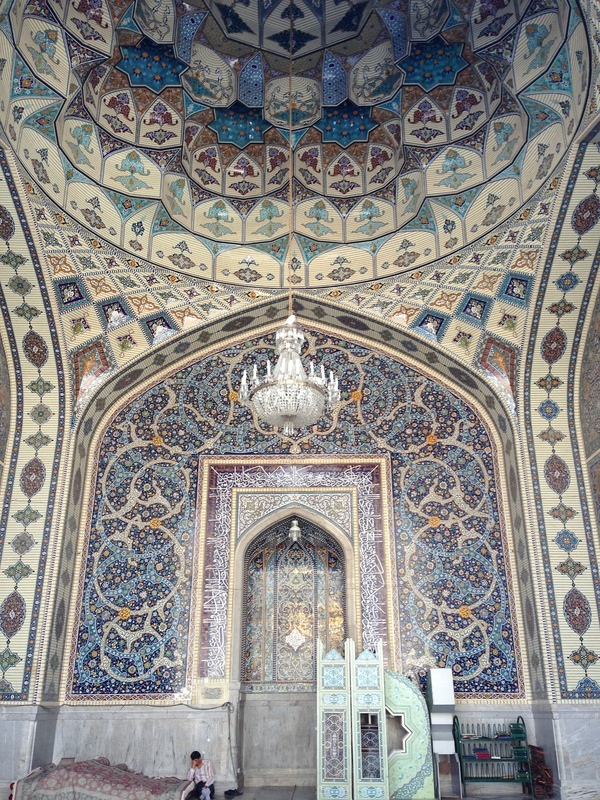 During the late Qajar period, the majority of those employed in the shrine received their salaries by the state. Thus, the shrine was not used for revolutionary purposes or bast. This was unusual in relation to other mosques and shrines across the country, which were host to a wide variety of political activities during the Tobacco Revolt in 1890 and Constitutional Revolution in 1906-11. Reza Shah came to power in 1925, and almost immediately embarked upon a series of reforms to Westernize and modernize Iran. The most famous of these reforms were the laws banning traditional dress, including women’s veil in the 1930s. Although the debate raged all over the country, due to the Shrine’s unique importance as a spiritual center, it became the site of a decisive confrontation between religious leaders and the authorities. It was especially important in the context of the shrine because kashf-e hejab, which prohibited women from covering their hair, had important implications for pilgrims. How were women to dress in the sacred space? An aerial view of the shrine from the early years of the Pahlavi period. During this period, the complex was directly accessible to the neighborhoods surrounding it. Photo from Michel Ecochard. “La Rénovation du centre de Mashad.” Banshoya Goto. 3 p.: Drawings 2, ill. 3. -(Extract from journal, s.n., 1975: 57-60). The Gohar Shad mosque became a site for members of the ulema to discuss Reza Shah’s dress code decrees. Ultimately, the Pahlavi government decided that scarves were illegal, but hats were not. The ulema reacted negatively to these new policies, and eventually took up bast (refuge) in the mosque. On July 13th 1935, government forces entered the site and fired at protesters, killing dozens. In 1936, a similar question arose, this time regarding Muslim women pilgrims from India and Afghanistan, and an understanding was reached they would be permitted to veil, as long as it was not in the traditional Iranian style with a black chador. The drive towards modernization would target the shrine in much bigger ways under the reign of Mohammad Reza Pahlavi, who succeeded his father in 1941. The complex was dramatically changed during this period of time, and entire neighborhoods around the complex were completely demolished by Mohammad Reza Shah in the 1960s, dramatically altering both the shape and experience of the shrine. Whereas prior to the demolitions the shrine was part and parcel of Mashhad’s urban fabric and was embedded in the very geography of the place, the destruction caused by planning authorities led to its monumentalization and isolated it from the surrounding city. This made political mobilization difficult in the complex, since there was no entry or escape that could not be monitored by authorities– in stark contrast to major mosques in almost every other city. An aerial view of the Imam Reza Shrine photographed on 22 September 1977 by Georg Gerster. The neighborhoods surrounding the shrine were demolished between 1975 and 1977. Furthermore, it cut the shrine off from the daily life of Mashhadis, making it primarily a structure for tourism and for visiting but one removed from daily life. By isolating the sacred even while seemingly highlighting it as the heart of the city, the Shah’s government also made a clear statement about the distinct division between daily life, which should be secular, and the private realm of the religious. 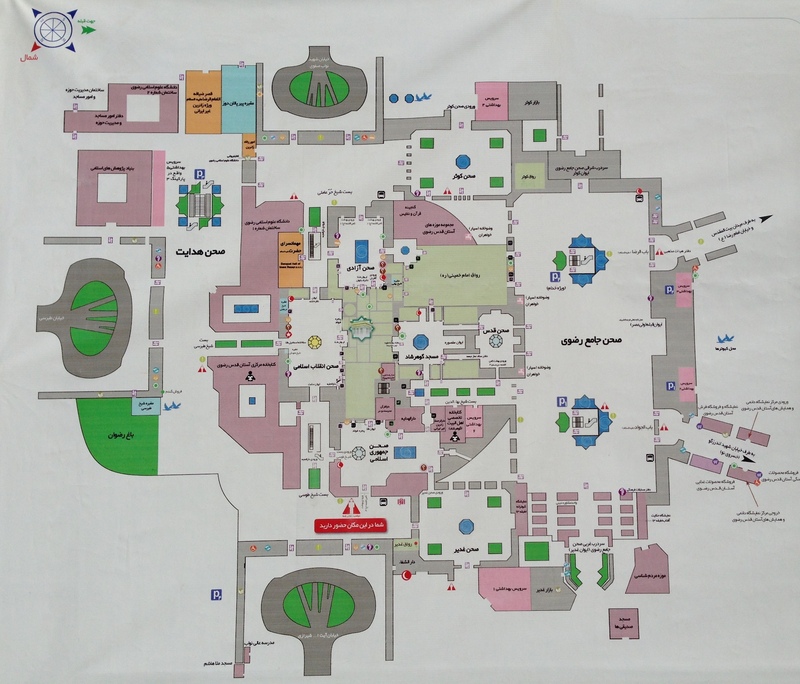 The Shah’s “modern Mashhad” (located further to the northwest) was oriented away from the complex and does not take the shrine as its main reference point. These changes allowed for the shrine to remain relatively quiet during much of the reign of Muhammad Reza Shah Pahlavi, but the site once again became a place of discontent during the 1979 Revolution. 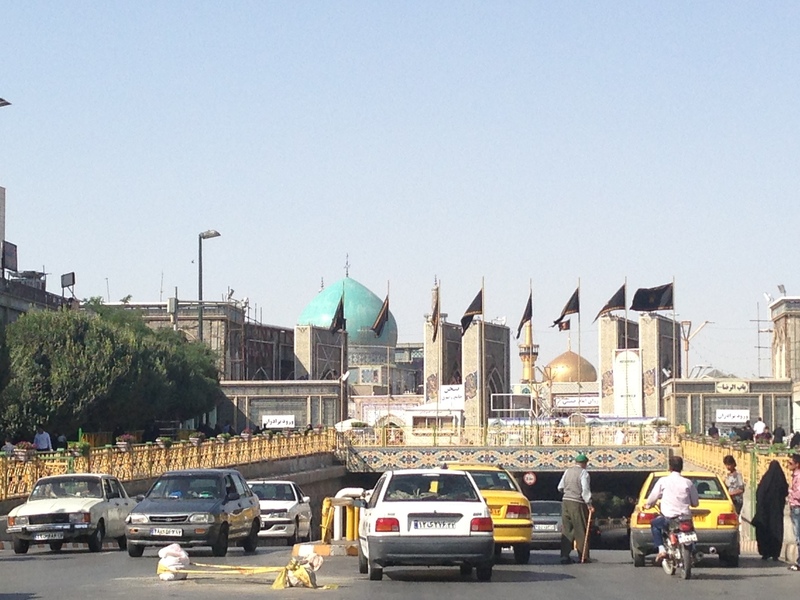 After the 1979 Revolution, the Islamic Republic strove to reconnect the shrine to the city. Today, a network of roads goes both around and underneath the shrine, ensuring that it is a central traffic circle for the entire city, allowing for people to travel to and from the Haram. And yet this network of roads does not isolate the shrine from the city, as it did under the Pahlavis, but instead weaves it into the city, sacralizing the everyday at the same time that it normalizes the sacred. However, this reconnection did not mean that the new government rebuilt the residential and commercial neighborhoods that encircled the Haram. Instead, the Islamic Republic took advantage of the Pahlavi era demolitions to expand the site to fit their own purposes. For example, the Islamic Republic was responsible for constructing the Jami’-e Razavi Courtyard on top of the area cleared by the Pahlavis decades earlier. It is now the largest open space in the shrine complex. With this expansion, the courtyard can hold over 100,000 people and can now accommodate large congregations for Friday prayers. 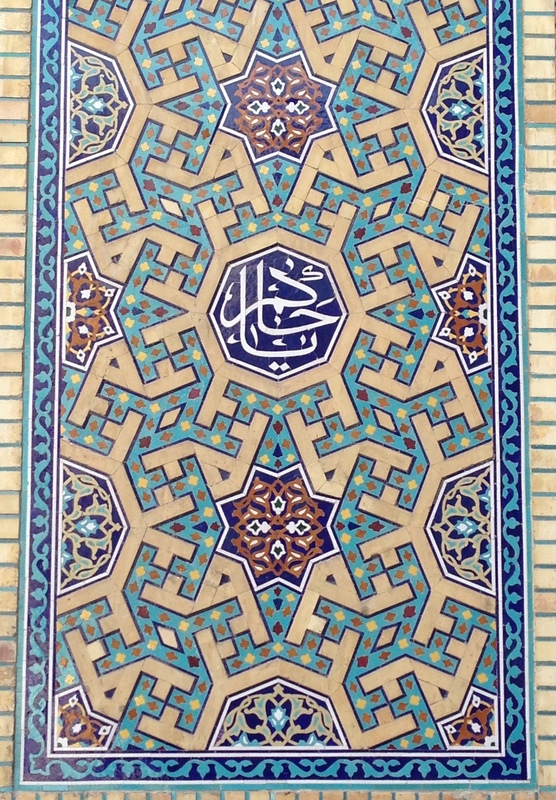 Sahn-e Qods, “the Qods Courtyard” was opened to the public in 1990, named after Jerusalem. 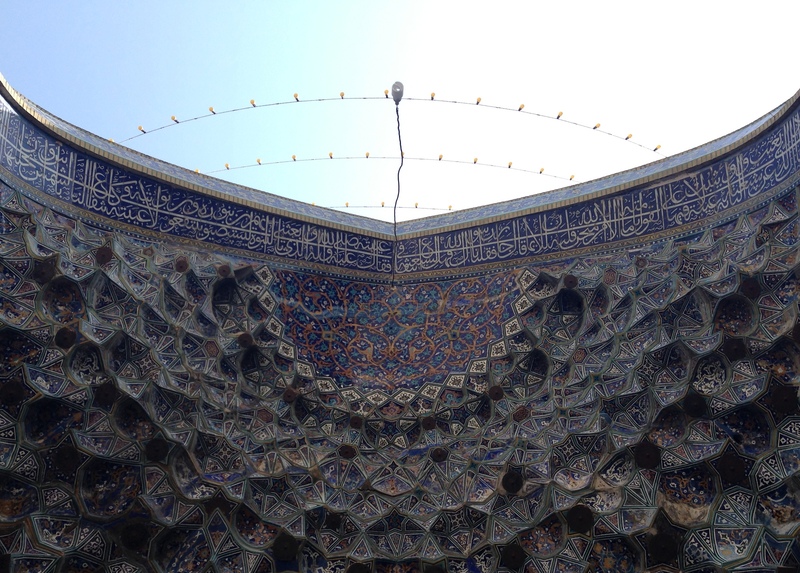 The saqqakhaneh is built in the shape of the Dome of the Rock in Jerusalem. Ideologues state that the repository was constructed to commemorate Jerusalem’s status as the the “First Qibla” of the Muslims. However, this architectural choice is also heavily ingrained by the Islamic Republic’s championing of the Palestinian narrative and highlights the current status of the Dome of the Rock under Israeli occupation. The exterior of it features the architecture and mosaic tile work of Masjid-e Aqsa and its dome is completely composed of gold. The relative decline in travel costs over the decades has led to an increasing number of pilgrims from the Arabian Peninsula, Lebanon, and Pakistan. Consequently many areas adjacent to the complex have been developed to take advantage of the influx of visitors. On Imam Reza Street, located south west of the shrine, many large corporations have constructed five-star luxury hotels to accommodate wealthy travelers. Such urban development has proven lucrative, which in turn has attracted more developers, raised property value, and significantly transformed the urban landscape surrounding the complex. Similar to holy places across the region, the increasingly transnational and middle-class nature of religious tourism has had the contradictory effect of making the shrines more accessible to a wider, more diverse public even as the old neighborhoods surrounding the shrine itself face a wave of gentrification and demolition. Cranes dominate the skyline around the complex as new accommodations are built for the increasing number of pilgrims. The Imam Reza Shrine has grown significantly over the centuries from a small shrine over the grave of the 8th Imam into the one of the largest religious complexes in the Islamic World. Since its establishment, the political powers that be have used the sacred space to demonstrate their temporal power, creating some of the most astounding wonders of Islamicate art. 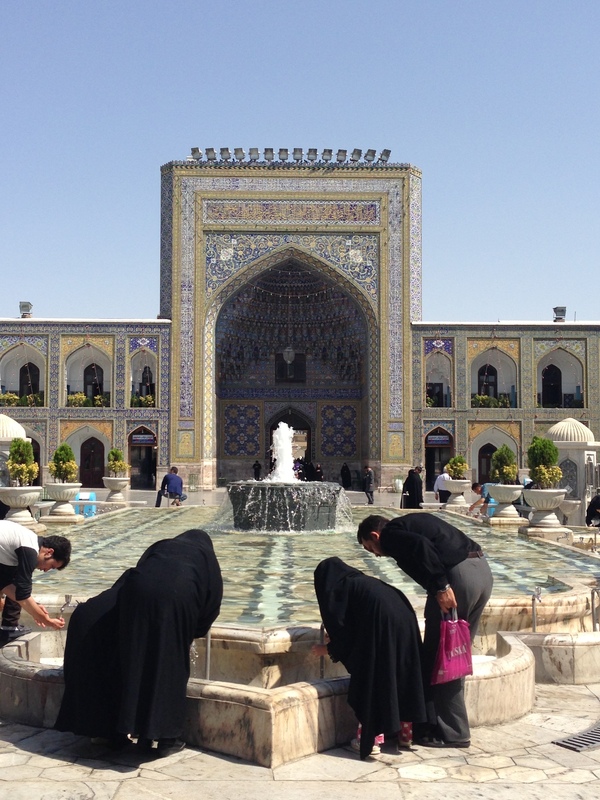 At the same time, Mashhad itself — the living, breathing city — is often the main victim of these grandiose visions, subject to the whims of far-off rulers for whom the city is an abstraction. As past and current trends have shown, the architecture and open spaces of the site will continue to be shaped and re-appropriated by the ideologies of governing powers. Nevertheless, the Haram continues to serve as an important and sacred place of worship and prayer for pilgrims from all over the world. Aghaie, Kamran Scot. The Martyrs of Karbala: Shi’i Symbols and Rituals in Modern Iran (Seattle: University of Washington Press, 2004). Amin, Camron. Making of the Modern Iranian Woman: Gender, State, Policy, and Popular Culture,1865-1946 (Gainesville: University Press of Florida, 2002). Pope, Arthur U. Persian Architecture. New York: George Braziller, 1965. Chehabi, Houchang E. “Staging the Emperor’s New Clothes: Dress Codes and Nation-Building under Reza Shah.” Iranian Studies. no. 3/4 (1993): 209-229. Cronin, Stephanie. “An Experiment in Revolutionary Nationalism: The Rebellion of Colonel Muhammad Taqi Khan Pasyan in Mashhad, April-October 1921.” Middle Eastern Studies. no. 4 (1997): 693-750. Donaldson, Dwight M. “Significant Miḥrābs in the Ḥaram at Mashhad.” Ars Islamica. (1935): 118-127. Ecochard. Michel. “La Rénovation du centre de Mashad:. Banshoya Goto. 3 p.: Drawings 2, ill. 3.- (Extract from journal, s.n., 1975: 57-60). Saadat, Bijan. 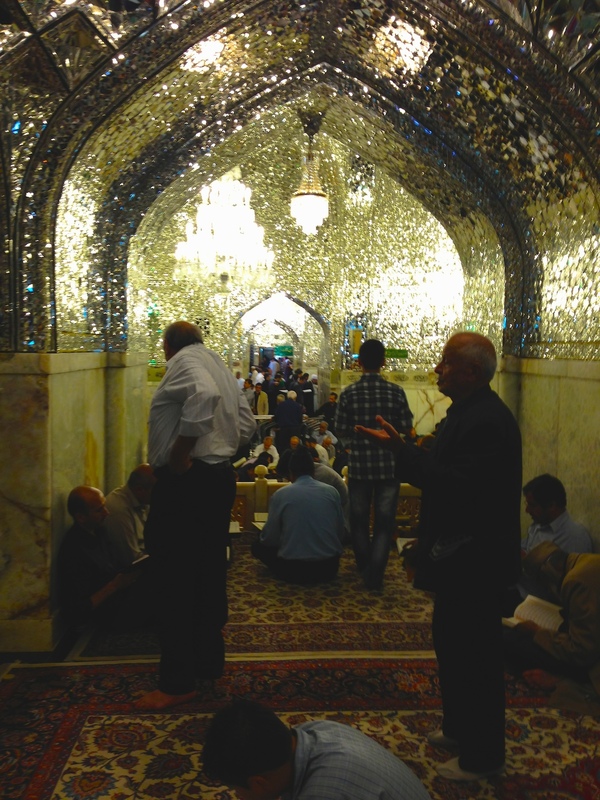 “The Holy Shrine of Imam Reza, Mashhad (Astan-i Quds).” Asia Institute, Pahlavi University. (1976). Soudavar Farmanfarmaian, Fatema. “James Baillie Fraser in Mashhad, or, the Pilgrimage of a Nineteenth-Century Scotsman to the Shrine of the Imām Riḍā.” Iran. (1996): 100-115. Subtelny, Maria. “Socioeconomic Bases of Cultural Patronage under the Later Timurids.” International Journal of Middle East Studies. no. 4 (1988): 479-505. Wilber, Donald. “Qavam al-Din ibn Zayn al-Din Shirazi: A Fifteenth-Century Timurid Architect.” Architectural History. (1987): 31-44. 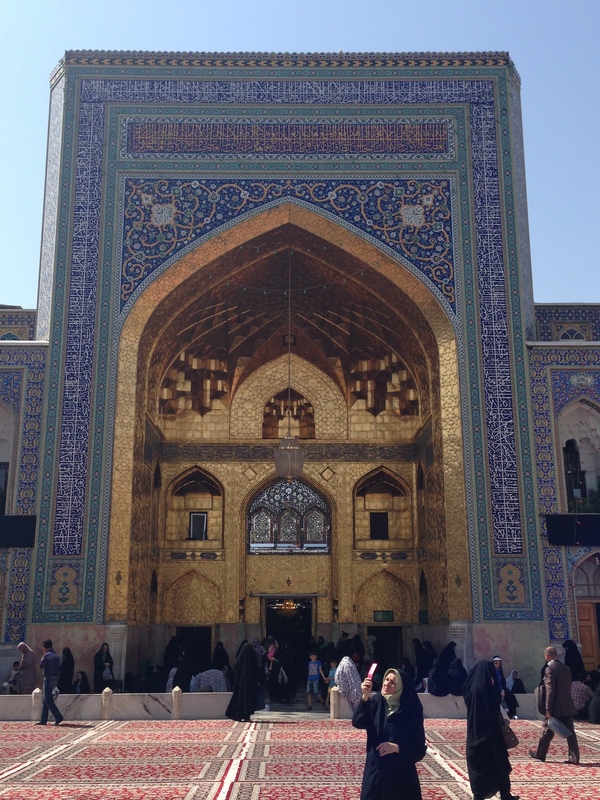 Archnet, “Imam Reza Shrine Complex.” Accessed December 27, 2013. 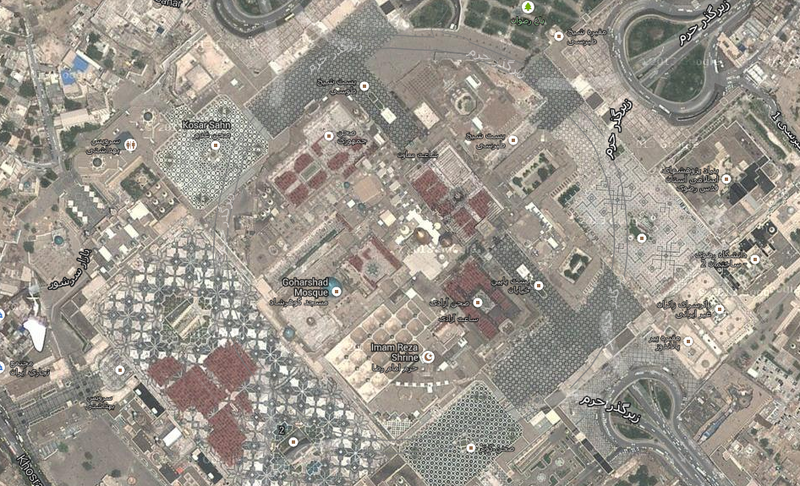 Imam Reza Network, “Sahn (Courtyards) Around the Holy Shrine.” Accessed December 27, 2013. Thanks for this great summary of many centuries of complex architectural history. Could I add a little more about Shah Abbas? 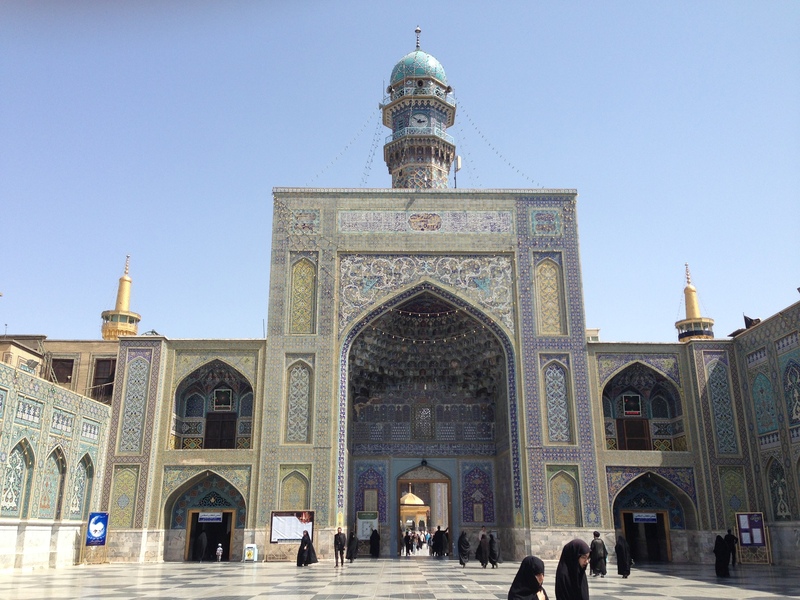 His walk to Mashhad was actually in 1601 (I have used the daily records of the Shah’s astrologer to be the first person in four hundred years to pinpoint the journey-route on the ground – see http://www.carolinemawer.com/shah-abbas/how-did-i-do-it/). He wasn’t barefoot – there is a first person account of him starting off in a simple robe and shoes (with six hundred beautiful young men). 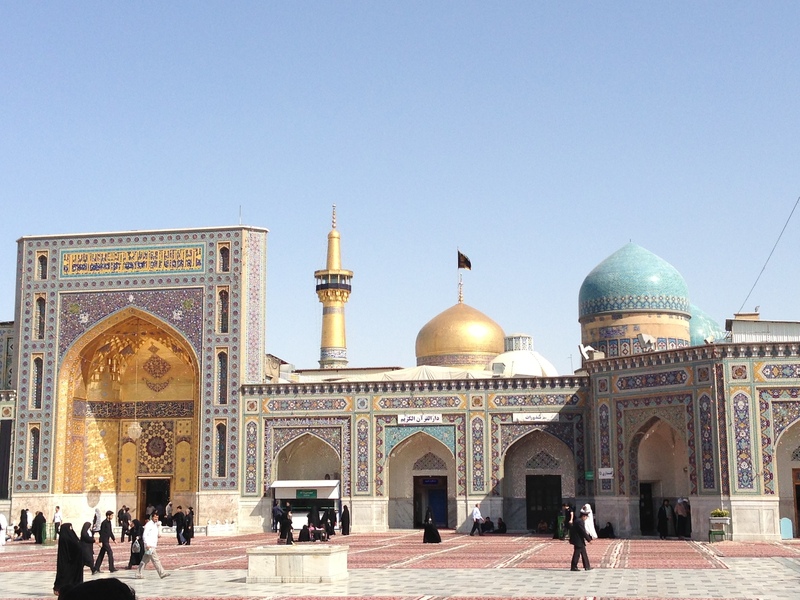 Abbas transformed Mashhad and the shrine. He extended the Old Courtyard to centre on what is now the golden ayvan, adding three other new ayvans. Two of his new ayvans were linked into a splendid avenue he created from the western to the eastern gate of the city. This had a canal of running water in its centre, flowing right through the shrine via a new pool in the middle of his new-Old Courtyard. 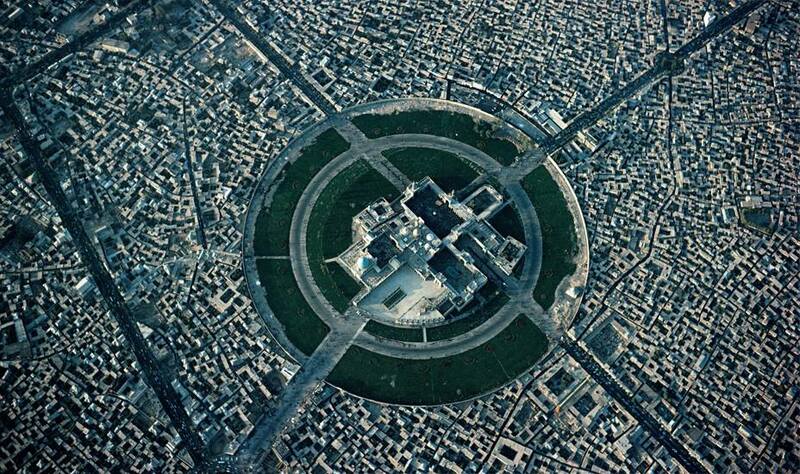 It was as transformational as Abbas’ more famous architectural work in Isfahan. 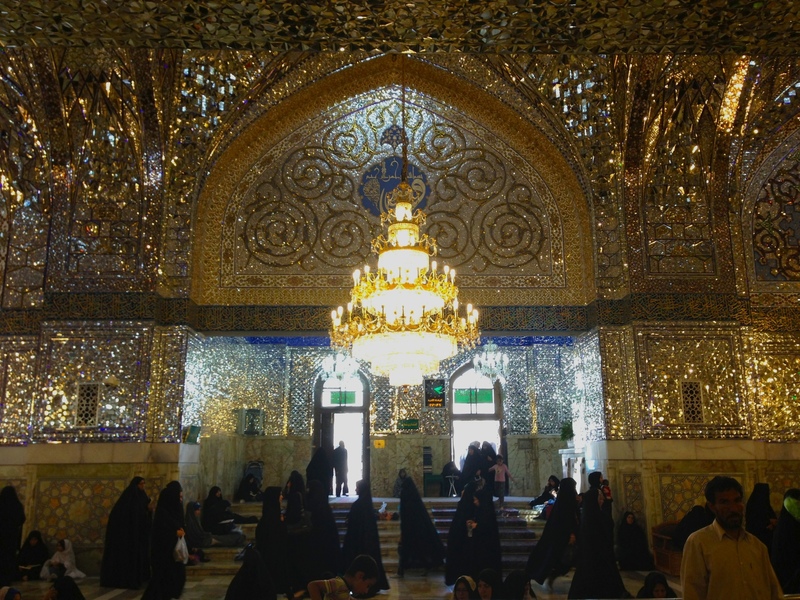 At the shrine, Abbas regilded the dome – and I think his patronage is most visible in the epigraphy he had installed on the golden dome. See : http://www.aoiusa.org/blog/wp-content/uploads/2010/08/muslim-shrine.png for an image. Whatever his reasons for promoting pilgrimage to Mashhad (and I agree that commerce was important), the development of road and caravanserai infrastructure – and security on the roads – that occurred in his reign was also key in making pilgrimage possible. Thanks again for your work – I will be following up your mention of Aqa Mohammad Khan Qajar. Great post! Thanks for sharing good post. Really very informative and very useful post. I like it. Thanks a lot for sharing. I question one statement in the article above. When I left Mashhad in spring 1973, the city still reached right to the shrine. All of that clearing must have happened between 1973 and 1977. Not in the 1960s. According to Ervand Abrahamian’s book “History of Modern Iran”, the targeting of bazaars came as a direct result of the formation of the Resurgence Party which was not established until March of 1975. See page 151: “The formation of the Resurgence Party had two profound — and, one could say, disastrous consequences for the regime. [….. T]he state now threatened to enter arenas it had kept out of in the past — the traditional middle class, especially the bazaars and the clerical establishment. […..] It talked openly of replacing ‘the flea-infested bazaars’ and the old city centers with new highways and modern state-run markets operated like London’s Covent Garden. The shah himself later stated that he had moved against the bazaars because they were ‘badly ventilated,’ ‘out-dated,’ and ‘fanatical.’ The area around Imam Reza Shrine was flattened ostensibly to beautify Mashed.” Your timeline aligns with Abrahamian’s, meaning the clearing most likely occurred sometime between 1975 and 1977. Subhan ALLAH. I have no words for these picture. These pictures having long and true story. I believe that your photo of the golden ivan captioned “Golden Ivan commissioned by Ali Shir Nava’i, completed 1470-1480” is actually a photograph of the golden ivan in the Sahn Azadi which was built by Fat’h Ali Shah and gilded by Nasir Al-Din Shah. The golden ivan built by Nava’i and gilded by Nadir Shah in the Sahn Inqilab is slightly different (with a larger grate-design in the middle, no cutouts on indentations, and two doors, rather than one door in the middle) and backed by a golden minaret which would be visible from this angle. That being said, this is a marvelous article and has helped me greatly in my research. Thank you. Wonderful information and pics. You should visit once in life. Great pilgrimage for Islam community. Amazing place and pictures I would surely visit there with my family.